We were recently contacted by an overseas multinational firm with a very pressing time schedule. They needed ten 400 business visas right away just before the Christmas Holiday. We were able to get their applications submitted and got 10 approvals in less than three days. Thank you so much for all all the effort and assistance of Yangwha mostly to Mike and all the staff who handled of all the documents and papers that needed to submit to DIBP its really a 50/50 chance because of my age. Then my Son Miguel Carlo turned 27 years of age more or less 3 weeks after we finally lodged the application for PR. It’s really hard to deal with it since immigration laws mostly change every year but after the long run from the application of renewal of Visa Sub class 457 till the application of to become a Permanent Residence here in Australia ( 27th January 2017 ). The hardworking staffs from Yangwha did their job well by checking all the documents and made sure that everything will be alright before lodging my application to DIBP. A heartfelt thanks also to Edith for doing her best handling all my papers and application and most of all I thank God for giving Mike and team wisdom, knowledge and guidance to run Yangwha Visa Consultancy. Finally my family and I are now Permanent Resident as of this date 3rd Day of August 2017!!! Taos puso po akong nagpapasalamat sa Yangwha Visa Consultancy Services Inc. dahil mula pa noong 2008 hanggang ngayon ay nariyan pa rin po kayo na umaalalay sa akin at iba pang mga Filipino na naririto sa australia…Salamat po sa another 4 years na working visa. MABUHAY PO KAYONG LAHAT!!! (English trans.) 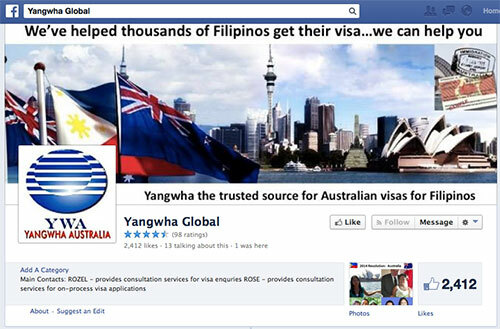 I wholeheartedly thank Yangwha Visa Consultancy Services Inc. for all your assistance to me and my fellow Filipinos in Australia. Thank you for another 4 year working visa. LONG LIVE, EVERYONE!!! Your service is fantastic. You definitely have answers to our queries. Your fee is really low compared to other visa consultancy and most of all, I find you accommodating. Thank you very much and God bless! Once again thank you for sending the details and providing other information. We really appreciate all your assistance and help extended to our family. Will be in touch and the family wish to meet you in the future when we visit the Philippines. Again, salamat po ng maraming marami !!! (Thank you very much!!!) God Bless! Thank you very much for all your help. More power to Yangwha. God bless us all! Thank you very much for the wonderful processing of our PR visa. Hoping we could pay you back even in a small and humble way. Again, in behalf of my family, my sincerest thanks for helping us fulfill our dreams. I would remember when I was on the struggle applying for a job here in Australia. It took me a year and a half with other agencies, but with Yangwha, all it took is just less than a week to get my visa. So when the time comes for me to apply for my PR status visa. I would definitely choose Yangwha. No questions asked! A lot of thanks to you both , Mike and Ms. Rozel and also your team. Greatly appreciated and let me take this opportunity to commend Yangwha and the whole staff for the great professional services and assistance they rendered from the time I was processing my visa back in Philippines to this visa assistance for my dependents. We would like to extend our warmest appreciation to YANGWHA for their hard work in processing our papers. Wishing that there are a lot more Filipino’s who will benefit in your good work and be hired here. Keep up the good work. God bless YANGWHA. Hi Yangwha, thank you so much for processing our permanent resident visa. There’s a lot of changes in our lives since we got our Permanent Residency. One of the most important is the benefit we are receiving from the government of Australia. We are so happy. Thank you so much. It’s been months since I’ve arrived here in Australia. Job in the meat industry was a bit difficult, but in the end a very rewarding one. Through the opportunity that YWA has given, I was able to conquer my weaknesses as a person, cherish the fruits of my hard work and face a bright future ahead. Now, I’m looking forward for the arrival of my family. My heartfelt gratitude to YWA specially to their staffs who treated us as a family when we are still on the process of getting here. More power!!! Good day! Hope you still remember me and my batch mates. Just thought of greeting you “Happy Easter!”. It has been a long time since we have gotten in touch with you. Also just want to thank you on behalf of our group for Yangwha’s help coming here in Australia. Yeah, we are now permanent residents and for that, we highly appreciate all your support and help. Hope to meet you again in the future.